Roads are closed off and buildings are swamped, and Portland has its third-highest tide on record. Thursday’s blizzard pushed tidal flooding to levels not seen in four decades, with Portland recording the third-highest tide since weather officials started keeping track more than 100 years ago. Flooded buildings and piers were reported all along the Maine coast, from Kennebunkport and Wells to as far east as Machias. 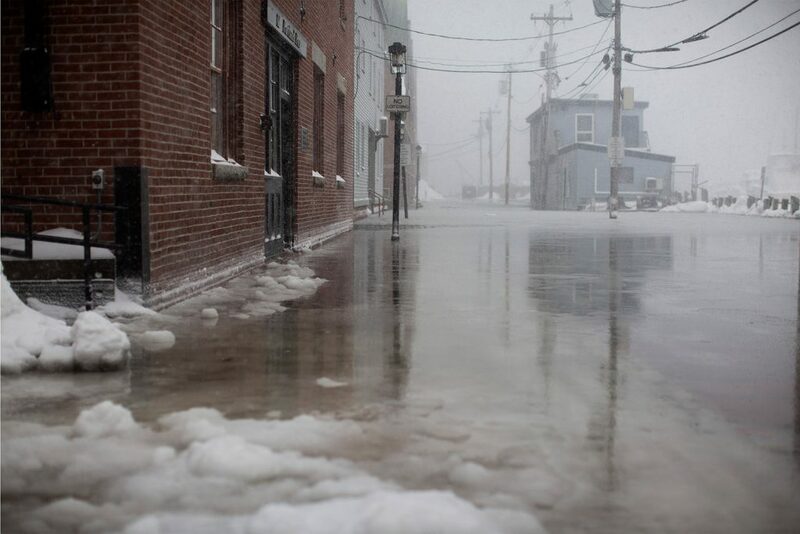 John Cannon, a senior meteorologist with the National Weather Service in Gray, said Thursday’s high tide in Portland was 13.79 feet, slightly below the 14.17 feet reported during the infamous Blizzard of 1978. The second-highest level, 13.98 feet, also happened in 1978. Cannon said sea levels already were high because of the nearly full moon, and the storm surge only made things worse. In Portland, there was flooding on piers near J’s Oyster House, on Somerset Street near Whole Foods and on Marginal Way near Diamond Street, said city spokeswoman Jessica Grondin. City officials advised motorists to turn around rather than drive through standing water. Sawyer Street in Scarborough near the Cape Elizabeth town line is closed off during the height of Thursday’s tidal flooding. Police also shut down Route 1 through the Scarborough Marsh during part of the storm. Both roads were reopened Thursday night. 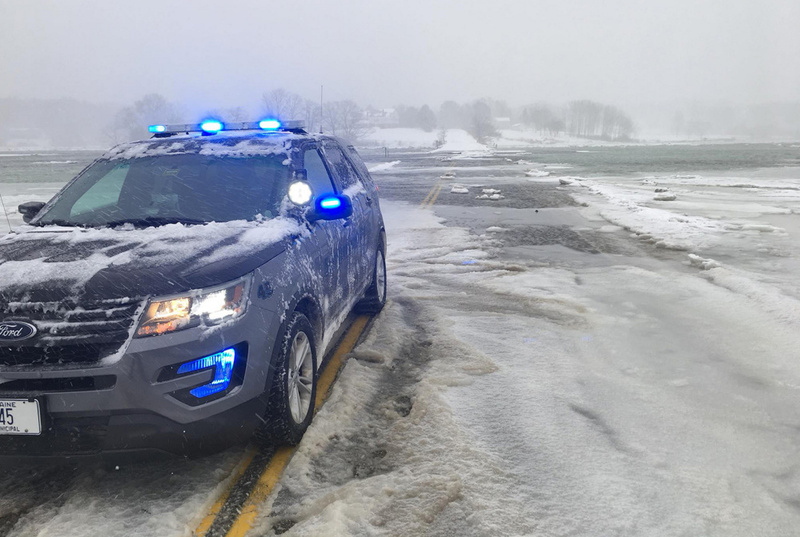 In Scarborough, high-tide flooding closed Route 1 near the Scarborough Marsh for about an hour, closed Sawyer Street near the Cape Elizabeth line for a short time and also flooded a private road, said Deputy Police Chief Marla St. Pierre. Pictures posted on social media from nearby Port Clyde showed severe flooding at the town’s commercial fishing pier. In Scarborough, the Clambake Restaurant on Pine Point was flooded. So was the Hurricane Restaurant at Dock Square in Kennebunkport. Luanne MacDonald, who owns the restaurant, said she had prepared for possible flooding Wednesday and hoped for the best. But when she arrived Thursday, there was significant water inside the restaurant. “I had to call the fire department because the water was over the (electrical) outlets and (there was) some smoking and sparking,” MacDonald said. Just a few days ago, she said, she had to close the restaurant unexpectedly because of burst pipes. “I had already made an insurance claim for that and now I’ll have to have (the adjuster) come back out,” she said. MacDonald didn’t know how much damage had been done, but she expected that she’d have to replace her heating and cooling system and possibly some kitchen equipment. 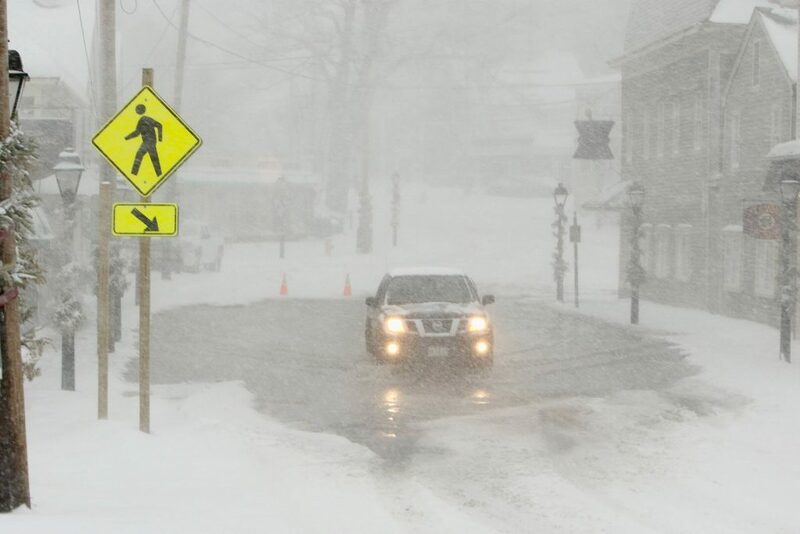 Throughout coastal Maine, many roads were closed or blocked off. In some areas, police kept drivers from trying to cross flooded roads. 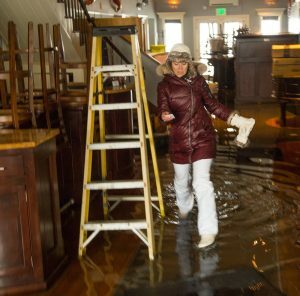 Hurricane Restaurant owner Luanne MacDonald walks through her flooded restaurant at Dock Square in Kennebunkport Thursday. MacDonald had to contend with burst pipes earlier this week. The biggest threat of flooding was at high tide, or around 12:30 p.m. in coastal York and Cumberland counties. “The worst is behind us,” Cannon said at midafternoon Thursday. The next high tide was to occur after midnight, but Cannon said he didn’t expect that to have a major impact because floodwaters will have largely receded by then. In the short term, the flooding was expected to erode beaches and possibly damage some coastal infrastructure, Cannon said, although it was too early to assess how widespread damage might be. “One concern is that this could leave us more vulnerable for the rest of the winter, particularly if another extreme storm hits,” he said. About a month before the highest tide on record in Maine, in February 1978, another major storm hit. Cannon said that storm significantly weakened some protective barriers along the coast, which made the February blizzard that much more catastrophic. “That could certainly happen again,” he said. High tide floods the Portland Pier just after 1 p.m. Thursday. South of Maine, many areas were experiencing high water levels as well, including Boston and coastal New Hampshire. Video footage on Facebook from a Boston television station showed a giant dumpster floating down a side street. The weather service station in Boston reported Thursday afternoon that flooding there also was approaching levels last seen in the Blizzard of ’78. “Major impacts & evacuations currently ongoing along the East Coast of Massachusetts,” the weather service posted on its Twitter page. Staff Writer Kelley Bouchard contributed to this report.